This game was released not very long ago-Feb 2006 in PAL regions and a couple months earlier elsewhere. it was one of the later PS2 games to be released and I think many people missed out on it and it really deserves some more attention. It is quite an amazing game, with a few minor flaws. The game plays like an action/adventure with a fair shake of adventuring(?) and platforming thrown in. Think Zelda crossed with Assassin's Creed perhaps. 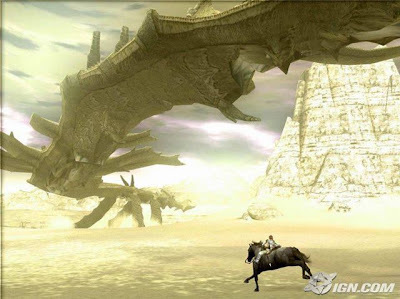 It is quite an unusual game in that the only enemies you fight are 16 colossi, which are essentially epic big boss battles where they are actually the stage you fight on for the most part. So for one thing, this makes the game relatively short. I finished the game in 12 and a half hours or so, but I don't think that counts the times I got killed and had to retry. Anyway, in my opinion the game time isn't really a negative point in that the game is very entertaining. Short, but sweet. There are some absolutely amazing fights in this game. Some of the issues I have with the game are the controls and the camera. 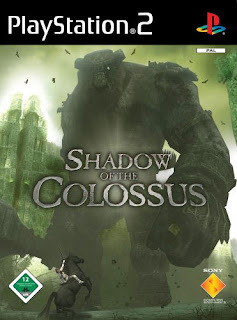 At times the controls are unresponsive, for example-I was trying to switch to my bow at one point to take advantage of a weakness I had triggered in one of the colossi, pushing right or left on the PS2's D-pad to change weapons. I pushed the button at least 4 or 5 times and it still wouldn't change, or if it did, it skipped past the bow to the sword again. Frustrating as hell because it meant I had to do that bit over again. This wasn't the only time I had problems with the buttons, many times the main character would lose his grip even though I was holding on and had grip left in my meter. Now I'm not exactly sure, this could be mainly down to my unofficial [Patrick from Spongebob] PS2 controller being on it's last legs, but I'm sure at times it wasn't the hardware's fault. So I'll not take this into account too much. There are lots of options for remapping controls and camera as well, which is a good thing. More than that though, the camera. I found this extremely annoying at times. The camera constantly tries to rotate back around to the default position. 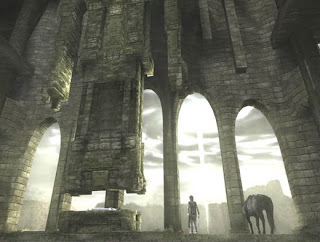 There were times that I would be running around the area and trying to manually move the camera so I could see not only where the colossus was, but what options I had in terms of the environment I was fighting it in. There is a button to automatically lock on to the colossus, and this definitely helps, but when you are trying not to die or fall off a ledge and simultaneously rotate the camera to see what options you have and it is moving itself back around, apparantely trying to kill you...it gets frustrating. One of the few flaws in the game, however not everyone notices it as much from what I've heard. There are some amazing battles which double up as puzzles, because some of them are quite hard to find out how to beat. If you like well designed, screen filling bosses, then this will not dissapoint you. There is a fair bit in terms of replayability as well, on beating the game for the first time you get access to Time Attack Mode and Hard Mode, and there are a few unlockables on your 2nd playthrough I think. Also first time round (and in any of the playthroughs) you can find secrets that will give you increased health and stamina gauges(like Zelda.) Apparantely there are fruit trees and lizards hidden around the world, I found one or two, but didnt realise their purpose till near the end, so just left them all for another game. For such a simple game, you only have 2 weapons the whole game and only a couple of maneuvers at your disposal(rolls, jumps, gripping and shimmying) the things they have done with the simple palette of gameplay options is quite intriguing. Less is more-I think that effectively describes the succinctness of the game in many aspects. The story is very 'read between the lines' and there has been much speculation and theorizing about the story, characters and ending on the internet. There is not a lot of dialogue, as you play the main character Wander, his only companion for the game being his horse Agro. The only dialogue present is really the clues coming after you beat each colossus, telling you of your next fight, and a bit at the end in a couple cutscenes. I mean, it is a very minimalistic, thin story, but I still find it very well done and effective. Essentially the story is that Wander, the protagonist has come to this land to try and save his lover (most likely, but it is not ever 100% said for sure how she relates to him) who is ill or dead (I'm not entirely sure.) The legends say that even the dead can be brought back if all the colossus of this land are slain-they can grant a wish. So with this legendary sword and bow in hand, he rides out with Mono on his horse, and comes across a massive, beautiful temple, which he leaves Mono in and this serves as the 'base' for the game. There are no towns or other NPCs in the game, I should add. So there is an immense feeling of loneliness throughout. Its really an amazing tale of how far one would go for their loved one, it can be very moving. So even though there is hardly any dialogue or story laid down explicitly for you, the implied story is quite amazing. Its very subtle and quite unique. I am only really marking it down since I think it would have benefited from more a bit more text, perhaps in the form of cutscenes, flashbacks or narration. Actually...that would probably weaken it. I like it as the minimalist piece of storytelling that it is. There is really not a lot to the characters, at times even their names do not seem important, it is all about the motives behind the actions of the main character, what lengths he would go to for Mono. This is made very clear and I think that is the only thing that we really need to know about the characters. Other than Wander, Mono and Agro, towards the end of the game we see a few other characters, and I'll not spoil anything for you, but very simple but strong characters in the game. Not an awful lot of growth, but still, I can't really fault the game too much. It is very different this game and I think all of the parts came together really strongly in the game. It is a work of art at times. For a PS2 title, the game has very nice graphics, there are only a few times where some jaggy bits, bad textures etc. At times, I was really impressed with some of the lighting, as you ride into one of the valleys, the sun is streaming towards you over the landscape and it looks like you are riding across a heavenly plain. The graphics are really well done, they have created this amazing game world which is on a huge scale for a game where you only fight 16 enemies. I mean, you could explore the world just to look at some of the areas-they really are nice. I found myself saying "wow" in my head a lot over the course of the game, it is such a nicely drawn game. My clumsy writing style doesn't do it justice, you should really play the game or have a look at some videos to get a better idea of just how nice looking it is. Again, the game really tries to add to the starkness and bleakness of the world with the audio, and does so very well. As you wander the land, there is actually no music, this might sound strange but it is quite interesting. You are listening to the sound of your character, the horse, the wind whistling past and it adds a lot of atmosphere-it makes it feel even more lonely in a way. A PS2 gem with only a few minor flaws and imperfections. A must play. Shin Megami Tensei: Strange Journey. IGN Games of the Year. Now Playing - "Kneel before me!"